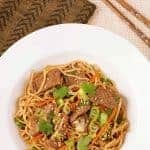 This tasty stir-fry recipe combines lo mein noodles with flank steak, fresh ginger, garlic, scallions, hoisin and a touch of five-spice powder to make a quick, easy one-dish dinner. Bring a large pot of salted water to a boil for the noodles. Combine the brown sugar and 1/4 teaspoon of the five-spice powder in a medium-sized mixing bowl. Add the soy sauce and stir until the sugar dissolves. Taste and add a little more five-spice powder if desired. Cutting with the grain, slice the steak lengthwise into 2 to 2-1/2-inch strips, then cut each strip across the grain into thin (1/4-inch) slices. Transfer the steak to the bowl with the soy sauce mixture and toss to coat. Set aside for 15 minutes. While the steak marinates, cook, drain and rinse the noodles according to package directions. Set aside. In a separate bowl, combine the remaining tablespoon of soy sauce with the hoisin and sriracha. Taste and add more sriracha if desired. Heat the oil in a wok or large frying pan over high heat. Add the garlic and ginger, stir fry for 1 minute, then add the beef. Continue stir-frying until the beef is lightly browned, 1-1/2 to 2 minutes. Stir in the hoisin mixture, cook 1 minute longer, then add the noodles, scallions, carrot and cilantro. Toss with tongs to combine thoroughly. To serve, plate individual portions and sprinkle each with sesame seeds. Commonly used in Chinese cuisine, five-spice powder is a richly-flavored blend of ground spices that typically includes cinnamon, cloves, star anise, fennel seed and white pepper. Five-spice is a potent seasoning and just a little goes a long way which is why we recommend starting with just 1/4 teaspoon to season the beef. The intensity of five-spice powder fades rather quickly with age – seemingly more so than other ground spices. Chances are if you have a fresh jar, you’ll need less than if it’s been on your spice shelf for a while. Whether or not you add more than that initial 1/4 teaspoon depends on your personal taste. If you want, you can leave it out of this recipe altogether, and just add a tiny pinch of cinnamon in it’s place.